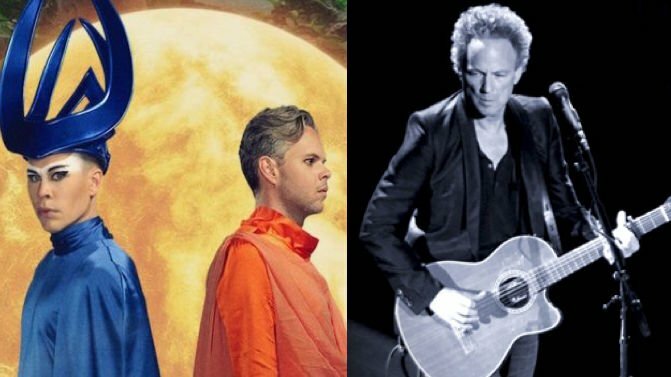 Empire Of The Sun‘s foretold collab with Fleetwood Mac’s Lindsay Buckingham has arrived. Dubbed To Her Door, the third cut of the Aussie electrolords’ forthcoming LP Two Vines is an ethereal and bittersweet tapestry of lush ’80s synths, undulating guitars and rich, warm vocals. Just like the disc’s previously released tunes High And Low and Two Vines, the song is built around a joyful and uplifting chorus, which is maybe laced with a bit more wistfulness this time around. “When you’ve got the undeniable, magical aura of Doctor Buckingham, things blossom,” Emperor Luke Steele tells NPR of their latest collaborator, whom also happens to be one of their musical heroes. “We jammed like we were in high school and it came together almost instantly,” he says. Conceptually, the song deals with a couple’s conversation the day after they’ve had a big argument, with Steele explaining that one partner has woken up surprised, anxious, and eager for reconnection. The follow-up to Empire Of The Sun’s 2013 album Ice On The Dune was co-produced by the Empire lads and Peter Mayes (Sia, The Killers, Mika) and features a bunch of high-profile contributions, not just from Lindsey Buckingham but also from Wendy Melvoin (from Prince’s band the Revolution), plus pianist Henry Hey and bassist Tim Lefebvre from David Bowie’s Blackstar band. Catch our latest lick of Two Vines, To Her Door, below.